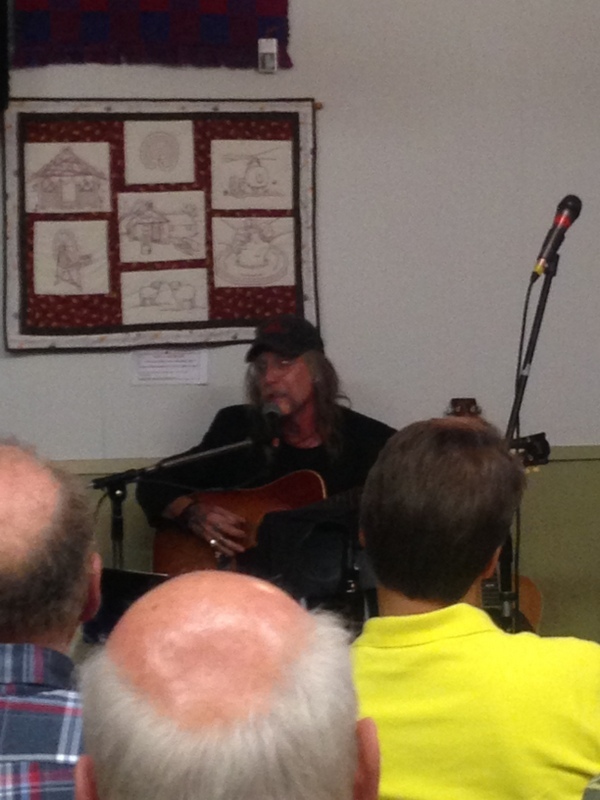 I’ll continue on with Friday evening in Deseronto and the concert. 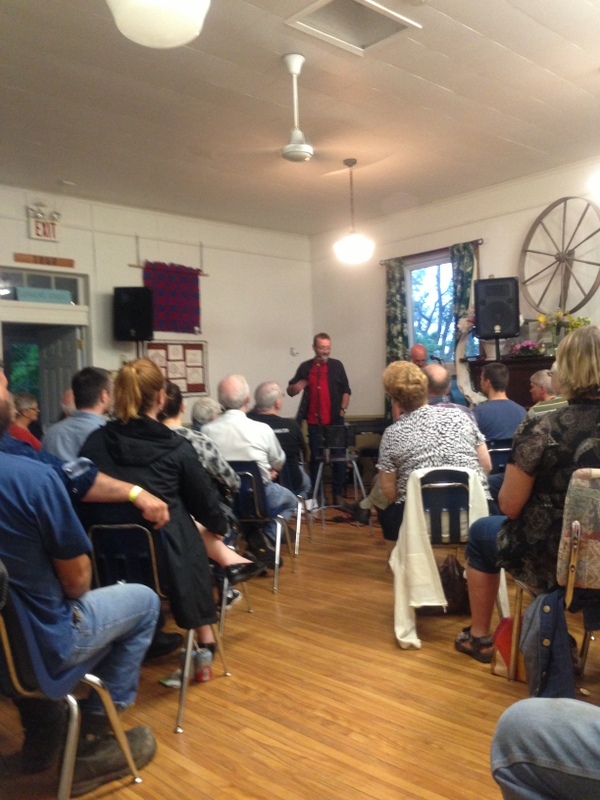 We were in another very unique venue – John McNeill’s Place. It was a combination antique store, art shop and restaurant, all rolled into one. Everyone who bought a ticket was treated to John’s special “summer solstice salad”, as it was the longest day of the year. The concert turned out to be a family affair. 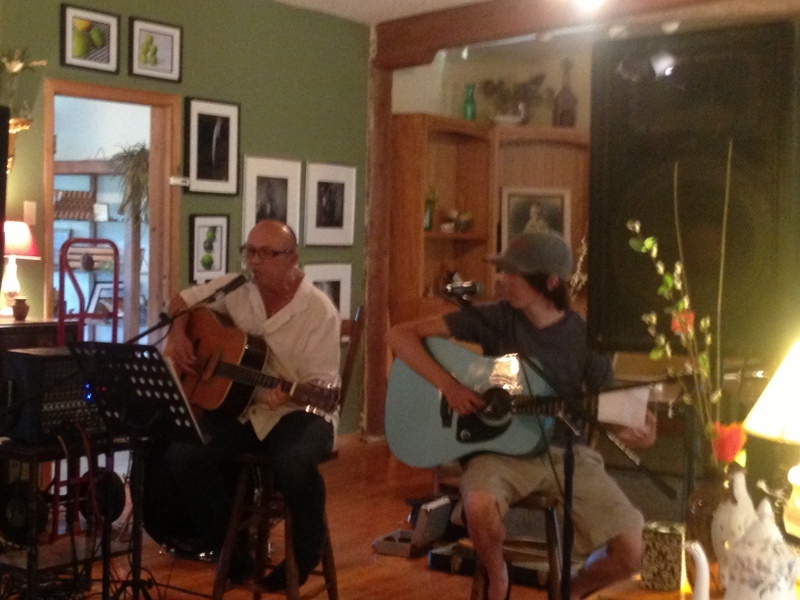 It started out with Roger Law, who is Doug’s brother, and his son Joe, both on guitar doing some wonderful cover tunes. Then it was the Werthmann’s turn, with Fred, who is Bill’s MUCH older brother, which Bill kept reminding him – I’m sure you all know how brothers tease each other. Fred said he hadn’t played publicly for a long time, so we were being treated to a rare performance. 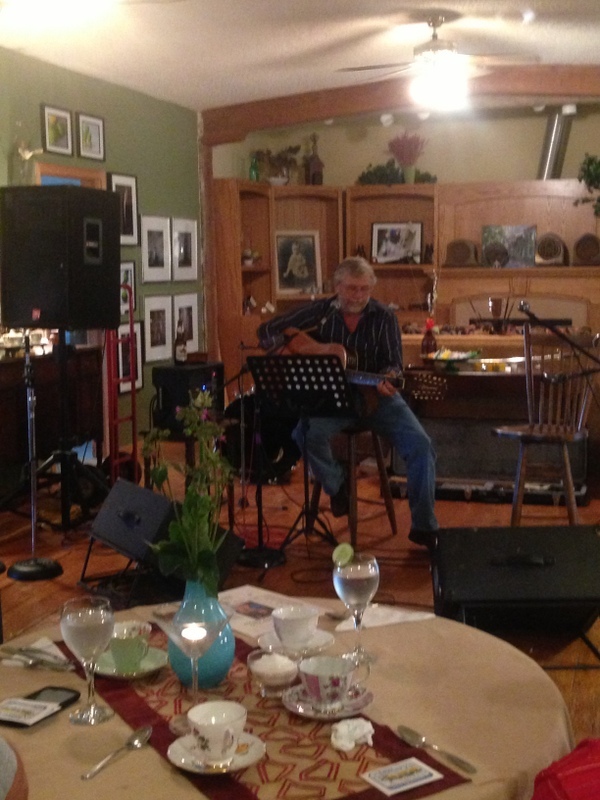 He played “Moonshadow”, which he said was one of Hillary’s favourite songs. 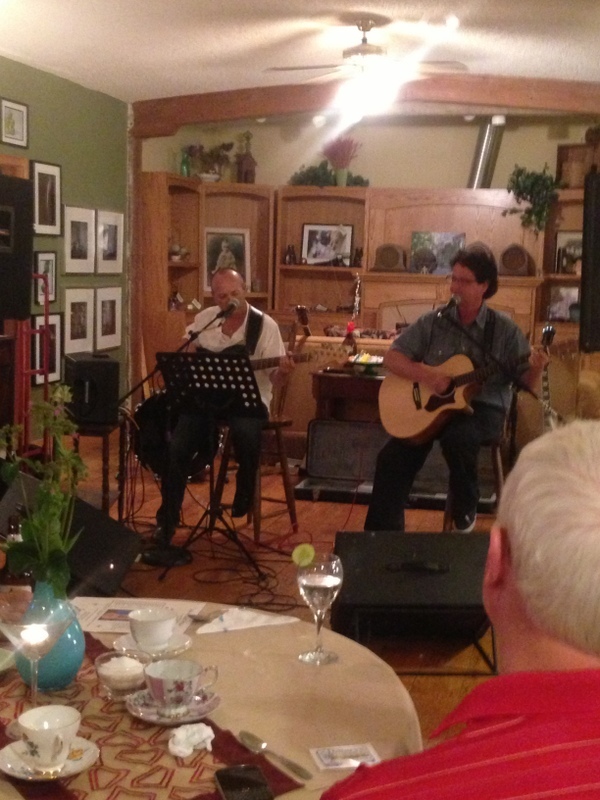 Then Bill performed, and turned the mike over to Kim Pollard, backed up by Roger. 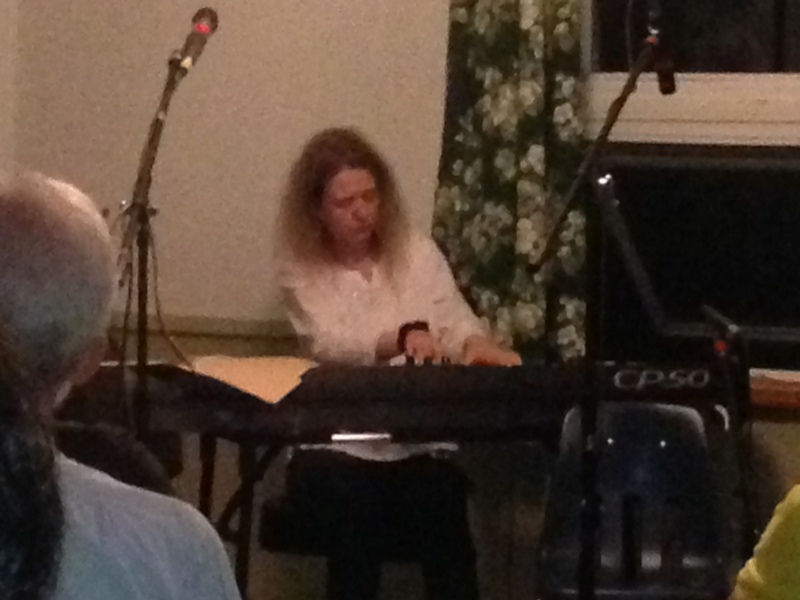 Kim had a CD release party the next night, so we were really fortunate to have her play for us. She has a very powerful stage presence, and we all got acquainted with another new artist that we hope to see again. Unfortunately, her CDs weren’t available for distribution yet, or I would have brought one home. The charity we were supporting was the Mental Health Support Network. 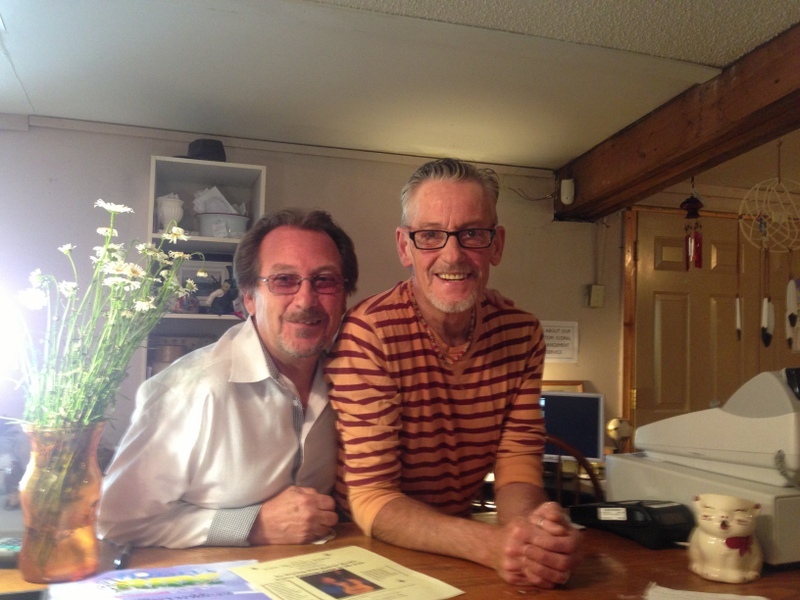 Their executive director, Garry Laws (no relation), spoke about their creative program , which addresses talking about the “elephant in the room”, which of course are mental health issues –our own and others. They work to empower individuals and companies to make it safe to talk about mental health issues, without fear of retribution and judgment. 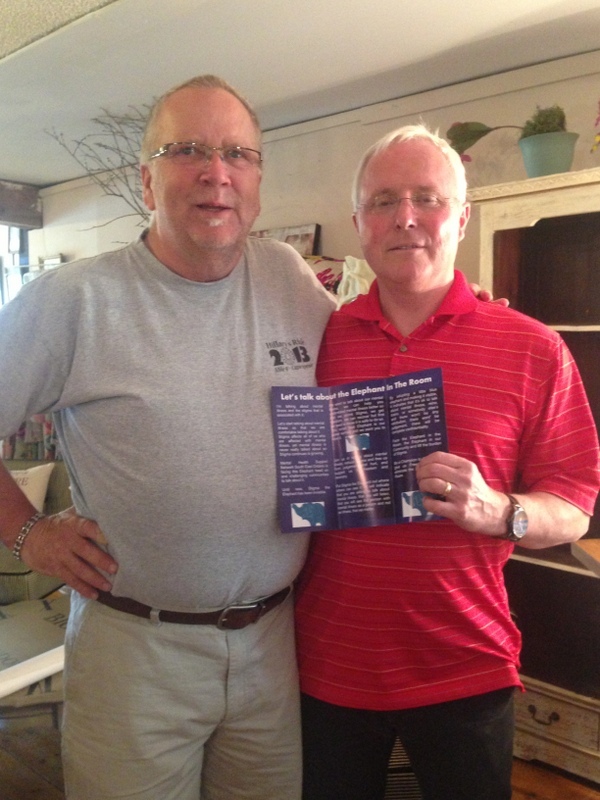 It is a great program, and he gave us little blue elephants and t-shirts to help spread his message. It has grown beyond the region they are working in, and I look forward to bringing the concept back to Alberta with us. I sat with Pam, Doug’s friendly wife, and her mother Mary, who was sharp as a tack. I had a great time getting to know them. Earlier I had met their two sons, Jake and Tom. I’m glad to report that Tom was doing fine after his trip to the hospital, and was very hungry, so that is always a good sign. I’ve been really fortunate to meet some really lovely families on our journey. There was a bit of a get-together in the back yard at Doug and Pam’s after the concert, but I squirreled myself away in the house to make sure I got out a blog that night. Time is limited when we have evening concerts. 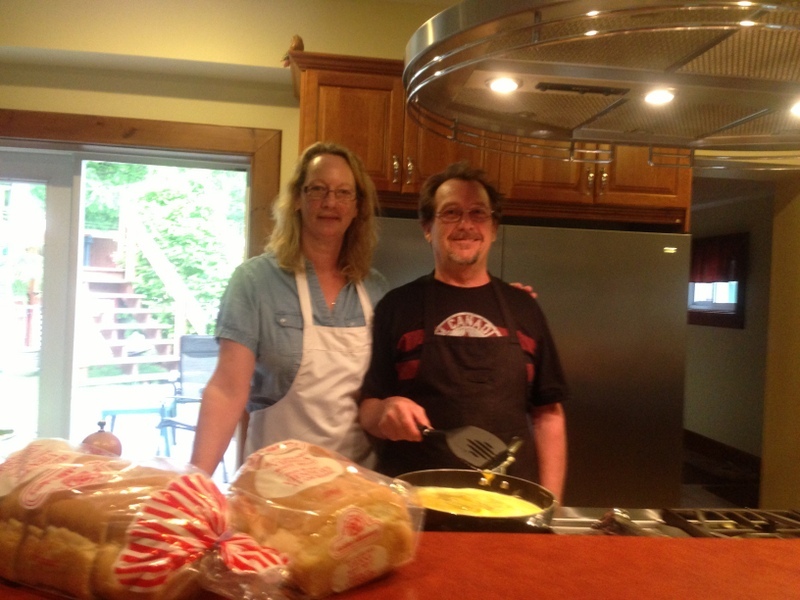 We woke up to a great breakfast spread of eggs, bacon and hashbrown patties, whipped up by Pam and Doug – they look so cute in their aprons! 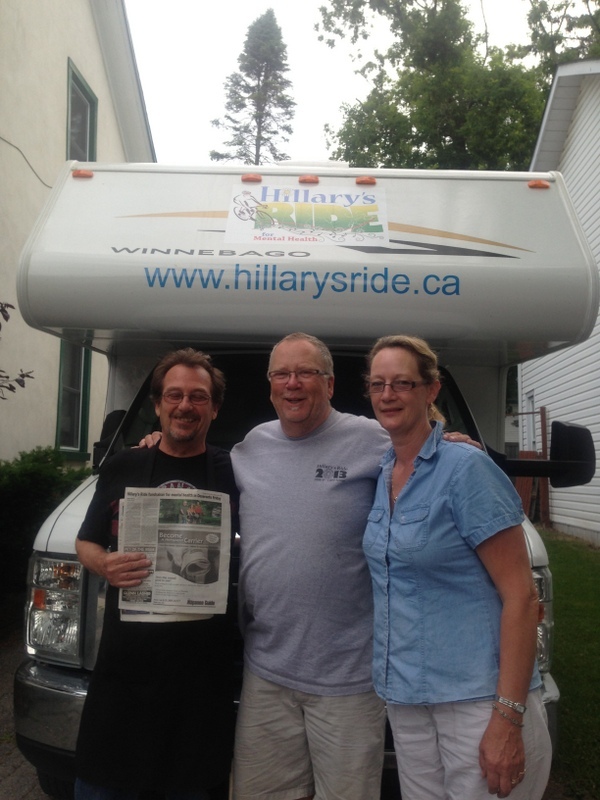 They also gave us copies of an article about the ride that was in the Napanee weekly newspaper. We were going to shuttle out a ways, which was a change to what we originally had planned, which was to return to Madoc. But as we were leaving Deseronto, we saw the lovely shoulder and the quiet roads, and decided to leave from there instead, and shuttle later in the day. So essentially, we took a detour from our detour of our original route – capisce? Anyway, as we travelled along, passing through Napanee and its heritage buildings, we decided to also go to through Kingston, as I had never been there, and Bill and Terry both thought it was worth another visit. So we re-detoured again (is that a word?) and headed towards the city that at one time was to be our nation’s capital – but it was within cannon-range of the US border, so they definitely rethought that idea. We lucked out that it was a Saturday, as we got downtown in time to see the farmer’s market. We stopped and had a great lunch at the Pan Chancho Bakery Cafe, eating outside in the garden patio. It was almost too trendy for our sweaty lycra, but Bill held up his pinky as he drank his water, so we were able to fake some class for the day. And of course we couldn’t leave without taking some edible souvenirs. 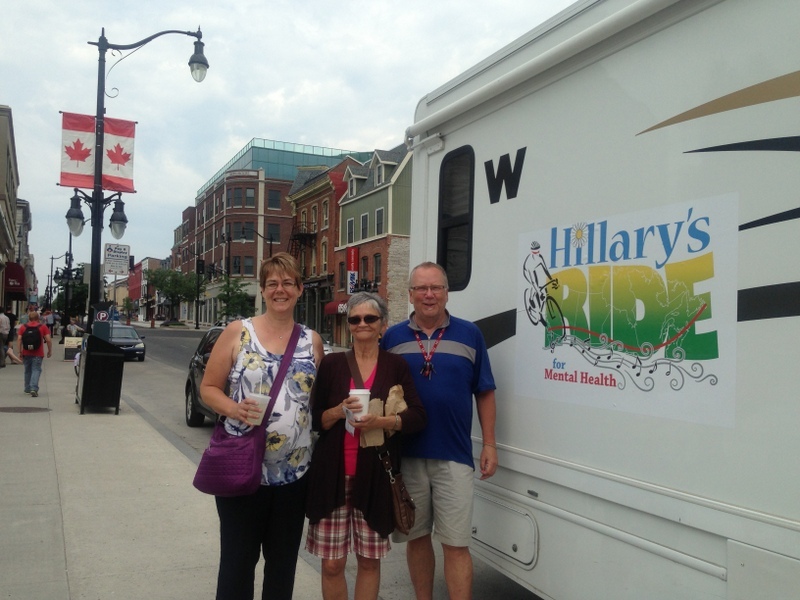 Outside the bakery, we met Linda and Sue, who were pondering our decal on the RV. We had a chat about our ride and the purpose of it, and they were very engaged with the idea. We shuttled north out of Kingston to start our ride up to McDonalds Corners. As we were preparing to get on our bikes and leave, Lorraine drove up in her truck, saying she had been looking for us. She said she was inspired by what we are doing, and that no parent should have to go through this, and that Hillary was smiling down on us. She was a mental health professional, and gave us a donation. If we had taken a slightly different route, we likely would never have met her. We have had many such “lucky” meetings, especially with other cyclists, and I feel like the universe is making these magical moments happen. 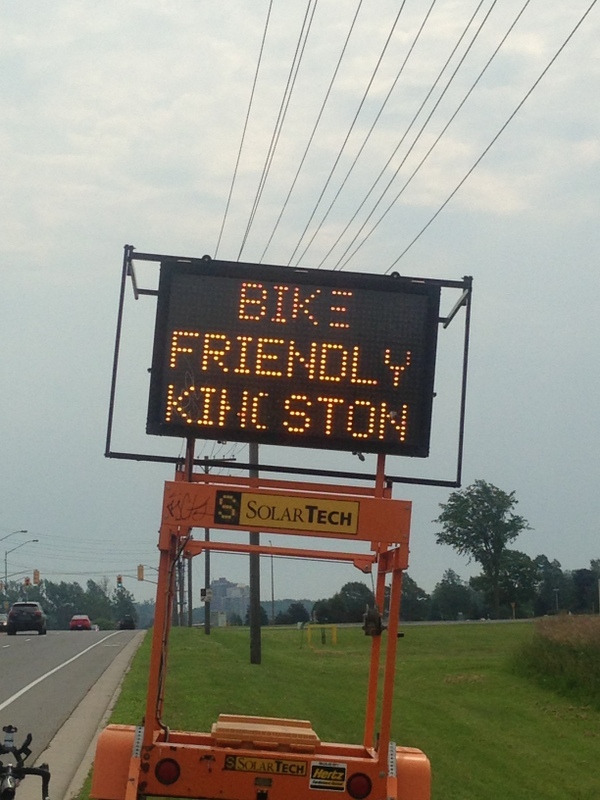 We agree – they are bike friendly!! Our afternoon had a lot different terrain compared to our morning. Although the countryside was beautiful, just full of lakes with people fishing wherever they could access the water, it was also extremely hilly. Non-stop ups and downs. As we neared our destination, we even took a road called Old Mountain Road, which was a steep uphill (hmmm…what was our first clue? ), and it never did drop down the rest of the day, so we didn’t get to enjoy a downhill at the end of all our work. But we soon arrived at David and Beth’s house in Elphin. They were so welcoming, along with their house guests Laura, Sara, Steve and Geoff. 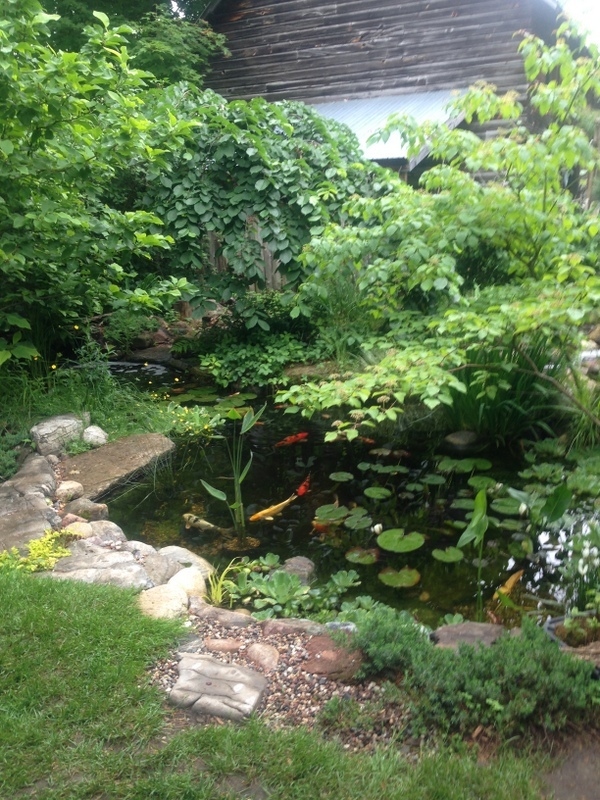 We got a tour of the garden and the Koi fish pond, and it is obvious that Beth has a more than just a green thumb – maybe a whole green arm!! While Geoff and David went to do sound check for the evening’s concert, the rest of us had a lovely dinner made by Beth. 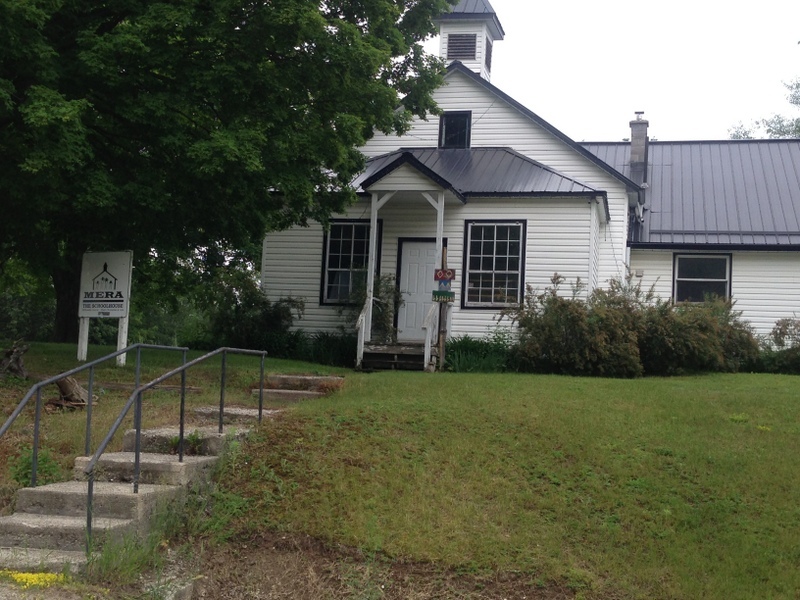 We all made our way to Mera, a cool old renovated school house for the sold-out concert. I was so thrilled to have my friends from Mississauga, Dan and Robbie, meet us there. They had tried to intercept us on the road, but our numerous detours made that pretty difficult – whoops! It was very special to have them there, like a little piece of home. 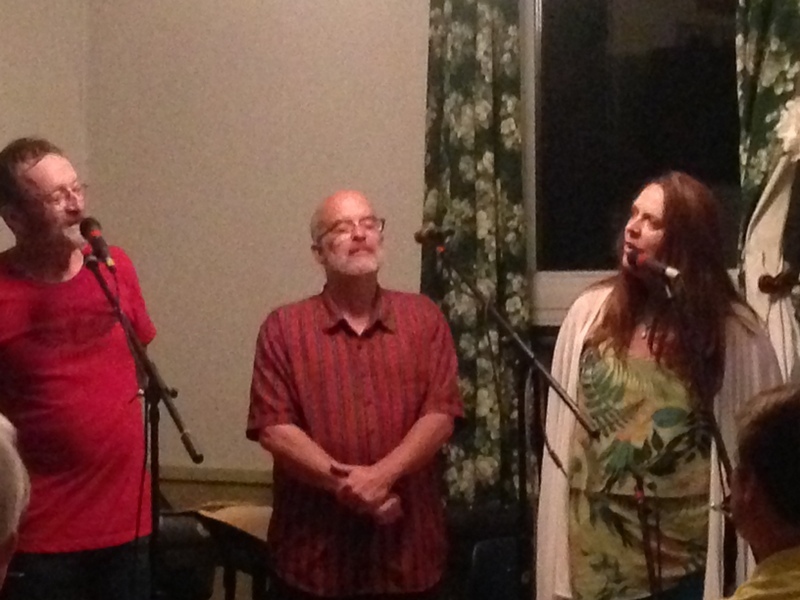 The concert was incredible and thoroughly enjoyable, as David Francey is one of my favourite singer-songwriters, and he was joined by several talented musicians – Geoff Somers plus Terry Tufts and Catherine Briggs. David told the stories behind his songs, and I love how it makes them come alive, like you are getting to know a good friend that much more intimately. The other musicians also did some of their own songs too, so I got treated to some wonderful new music, at least new to me! After the show, we didn’t have far to go to as we stayed in the RV in the school parking lot. I ended up having a very enlightening discussion with “W”, who told me about the struggles his wife had with depression many years ago. She was having problems finding a medication that worked for her, without devastating side effects. During this time, she had six suicide attempts, which was extremely difficult on him as she would disappear and he would have to search to find her. However, with courage they persevered and found treatments that worked for her, and she has been doing well for many years now. I hope this brings hope to others who struggle to find what works for them individually – it can take time, which can be so difficult when you feel hopeless, but know that a full and satisfying life can be possible. 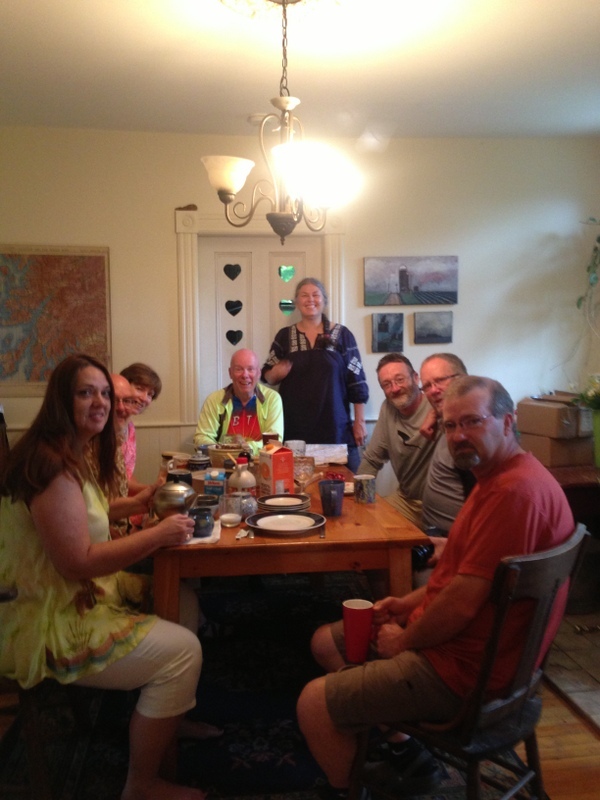 We returned to David and Beth’s place in the morning, as they invited us for breakfast, and we NEVER turn down a breakfast – it’s the most important meal of the day, and doubly so when you are cycling all day. Yummy french toast, eggs, bacon and all the fixin’s, and some of Laura’s specialty teas. We didn’t get away until late, as we were having such a great visit that we didn’t really want to leave. Beth helped us map out a nice flat, quiet route into Ottawa, starting from Perth. Perth also has a lot of beautiful old stone buildings, as well as all the red brick houses we have been seeing since we have gotten into southern Ontario. It was an easy ride in since there was not much wind. We made our way south to the home of Nix, Mal and Diane, who are long-time friends of Bill’s family. Mal cooked us a fabulous meal of barbecued ribs, which she knew was one of Bill’s favourite meals. And after dinner we had fascinating discussion about folk music performers. Or, should I say they talked and I listened, as they are all incredibly knowledgable about that genre, and I just sat in amazement and tried to soak it all in. Bill stayed at their place, while Terry and I went to the National Hotel and Suites, as they had generously donated a two-bedroom suite for us for the 3 days we were in Ottawa. What a treat, having my own king-sized bed and TV to catch up on some news! I was really looking forward to our day off tomorrow, to rest and get ready for our blockbuster of a concert! And one last note – we are just catching up on the photos of the flooding in Alberta. Our hearts and thoughts are with our fellow Albertans who are dealing with the aftermath. Stay strong, we’re sending you courage through the airwaves. I’m enjoying your excellent blogs Sue. An you are all doing, on schedule too! Keep your wheels turning, the east coast is getting closer! I was so anxious to hear how the three concerts went in Ontario. Thanks for the update. You make this trip so interesting and the heartwarming stories of people you have met who have been dealing with mental health issues and suicide shows all of us who read the blogs that the message is getting through and that people need not feel shame or more importantly..alone. There is help, there are people who care. Thank you for keeping all of us in the loop. Ride safe and I look forward to the next blog.